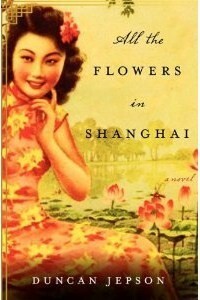 All The Flowers in Shanghai is set during the 1930's in China on the brink of the Cultural Revolution. The main character is Xiao Feng, a young woman forced by her parents into a marriage with the oldest son of the wealthy and highly esteemed Sang family. Feng's one role in marriage is to provide the Sang's with a male heir and she is treated cruely by her new family. In her anger and bitterness, she finds a way to get revenge on the family but it comes with a terrible price. About on par with what I expect from a historical fiction novel. It was well-researched, although the historical setting takes a back seat to the story. The writing kept me interested without being overly descriptive and wordy. I was briefly bothered by Feng's use of American slang (four letter words mostly) that really didn't seem to fit well in the setting, but it wasn't something that ruined the book for me. I enjoyed the book, but I didn't like the ending. That doesn't mean that the ending was bad or didn't fit with the story, but it wasn't what I wanted from the characters. I rushed through probably the last fifty pages because I had lost interest in the story once the final plot point fell into place. I also wished that the Cultural Revolution had played more of a role in the overall story. I recommend it to readers of historical fiction, especially those interested in Asia. If you read and liked Snow Flower and the Secret Fan, I think you would certainly enjoy this one as well. Just don't go into it expecting a detailed history of the Cultural Revolution - I think it actually reads better if you are already familiar to some extent with Mao and his policies and the sweep of the Cultural Revolution. I think this would be a good book to read along with Balzac and the Little Chinese Seamstress. Thank you to TLC for sending me a copy to review. Click here to see the list of all the others who are reviewing this one. I really don't like it when authors use modern slang/words in historical fiction, I find it very jarring. That said, I do think this sounds interesting, definitely something I would enjoy. You've got me curious about what Feng's act of revenge was! Sam - you should definitely check it out - the use of slang only really happened once and while it was momentarily jarring, it didn't ruin the book for me. Trish - if Lisa like Snow Flower I think she'll definitely enjoy this one!